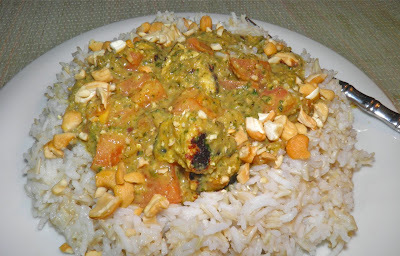 Pudina Paneer, topped with cashews and served with basmati rice. So this is the promised recipe from yesterday’s post on how to make paneer. It’s for a delicious dish bursting with flavours from India. If you're going to make a culturally significant ingredient (paneer) you may as well use it in one of the ways it was intended, and this recipe most certainly is that. Pudina (Mint) Paneer has many variants. This recipe is a combination of several recipes and quite tasty, if I do say so myself. When you scan the ingredients don't be be surprised by the amount of garden mint. If you’ve made pesto you will know that the 2 cups of basil is quite different than just a few leaves. The same holds true here. It’s transformed into something other than a mouthful of mint. 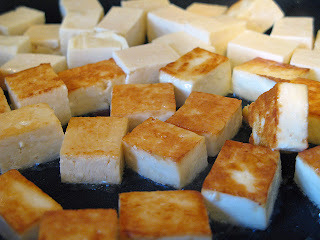 You can either fry the paneer whole and cube it, or cut it beforehand. If you don’t have fresh mint (you should get it if you can) substitute dried in a ratio of 1:4. So you will need about 1/2 cup of dried mint. That ratio holds true for most fresh-to-dry herb substitutions of any quantity. Don’t be concerned about the 3 large jalapenos either. They’re just the right amount. Since they are seeded and ribbed a substantial amount of the heat is gone. If you want a spicier dish, leave some of them in. Good Indian food has everything in perfect balance. Of course, if you wish you can purchase paneer from an Indian grocery. Buy why would you? It's so easy and so much fun to make. Pudina Paneer is common throughout the country. What makes this southern is the inclusion of coconut milk. I hope you like this recipe. We certainly did. 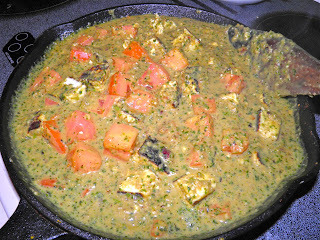 Only simmer the tomatoes and paneer until heated through. Add some oil to a large flat bottomed pan. Add the paneer and fry on both sides until golden. (It may be advantageous to use a non-stick pan.) Cube the fried paneer and set aside. Fry the onions until softened, then add the jalapenos and garlic and fry until the onions begin to brown slightly. This adds depth of flavour. Add the cardamom, Garam masala and turmeric and fry for 1 minute. Place 1/2 of the cashews in a food processor and pulse until well ground. Add the fried onion mixture to the processor with the remaining ingredients except for the tomato, paneer and salt. Purée. Heat the purée up to simmer in a wide bottomed pan and cook for 3-4 minutes. Add salt and pepper as desired at this point. Add the fried paneer cubes and tomato. Gently cook until heated through. If you cook it too long you will will break down the tomatoes. We want chunks. Serve with basmati rice and naan bread. Garnish with the remaining cashews. Please note I do not allow comments that redirect as I cannot guarantee their contents.